When my husband Geoff and I first met (11 years ago!) we were both poor college students. Geoff was vegetarian (which is funny to me now, considering how much he loves a good Double Double from In n Out) and his favorite food was tomato soup. From the can. I can't even tell you how many times he made tomato soup for me when we were first dating... we'd eat it in the tiny room he rented and watch crazy foreign movies. I've never been a huge fan of the canned soups, but especially now that we have kids, we've tried to cut out processed foods wherever possible. I do have a good slow cooker tomato basil soup that we really like, but I was hoping to find a quick and easy recipe that would approximate the taste of Geoff's favorite canned soup while still being reasonably healthy and delicious. And this is it! The soup is creamy and flavorful, with a perfectly balanced texture. And the best part is that it's so quick and easy to make! It really doesn't take much longer than opening a can of condensed soup. 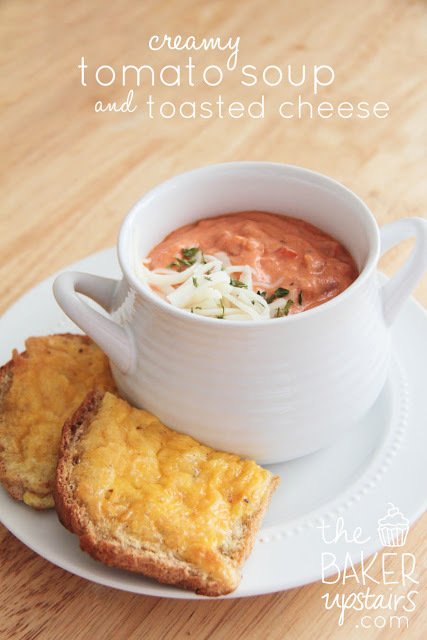 Add my favorite toasted cheese on the side, and you can have a delicious dinner on the table in about twenty minutes! Melt butter in saucepan. Once melted add garlic and sauté for a minute or two. Stir in flour and make a roux. Once roux is formed, slowly pour in milk, stirring as you pour. Stir consistently until it begins to thicken. Stir in chicken base, diced tomatoes, tomato puree, sugar, basil, pepper and salt. Stir until heated through. If needed add milk to soup to thin to desired consistency. Preheat oven to 400. Place bread slices on a baking sheet. In a small bowl, whisk egg until blended. Add cheese, mustard, and salt and pepper, and mix until combined. Spread egg/cheese mixture on each slice of bread, and bake 10-15 minutes, or until cheese is melted and bubbling. happy new year (and my fave recipes of 2012)!